HDH will return to its regularly scheduled slot next week. I know you've all been shedding buckets of tears about its absence. Speaking of buckets, one of my favorite memories involves walking down the Strand in Galveston one year with Jim, Tim, and our friend Steve C. I won't publish photos of them trying on cowboy hats, because I need their friendship. 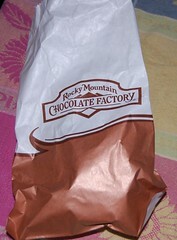 But I'll never forget Tim stopping into the Rocky Mountain Chocolate Factory. When he came out, I asked what he was eating, and he answered, "Peanut butter bucket" with an accent that could have come right out of my deep South childhood. When The Brides, Tom, and I went to Galveston recently, guess what I brought back for Tim? As soon as he saw the bag, he said, in the same accent, "Is that a peanut butter bucket?" It wasn't. It was TWO peanut butter buckets.